Industrial Plant and Refinery Operations, Home, Farm, Marine, Sporting Equipment, Aircraft maintenance, Assembly & Breakdown Operations, High Speed Chains, Automotive, Oil Field Equipment, Free: Nuts, Bolts, Licks, Pins, Set Screws, Switches, Pulleys, Pistons. MX-237 will penetrate shallow surfaces quickly to free frozen parts. Due to its high sliding velocity and non-drying characteristics, it will continue to penetrate long after other oils have evaporated. To speed up the penetrating action on extremely deep or heavily corroded pieces, THE MASTER OIL can be heated in a container and the pieces placed in it to soak. For larger pieces, or where soaking is not practical, heat can be applied to the affected area with a torch to facilitate the penetrating action. In most cases, parts considered permanently frozen or un-salvageable can be freed or reclaimed by merely applying MX-237 and allowing it to set for 24 to 48 hours. The very best insurance against corrosion is the application of MX-237 prior to exposure to corrosive conditions. It will leave a non-drying film to insure long lasting protection against harmful rust and corrosion. As the cost of replacement parts and labor continue to rise, the need for a product capable of reducing these expenditures becomes more important. MX-237’s low coefficient of friction will aid in extending the life of moving parts in tools, machines and engines. The protection it provides will greatly extend the life of parts thus avoiding much down time and repair or replacement cost. Its high flash point is an indicator of its ability to lubricate where friction and/or temperatures would break down or burn up other lubricants. MX-237 is useful in emergency situations where short extension in the life of a worn out part is necessary. If it is used from the beginning, the reduction of wear will significantly increase the life span of the parts. Nothing exceeds MX-237 as a high speed chain lubricant. Today, the metalworking industry is meeting demands for more parts, better parts, and more complex parts through constant improvements in metalworking techniques. With the need for higher production came the development of improved machine tools, better cutting tool materials, and this in turn created a demand for greatly improved cutting fluids for wide varieties of cutting operations. Molecules of MX-237 chemically combine with the surface atomic structure of the metal. The clinging film is tough and resists removal even at high pressure. This film also penetrates to the cutting edge of capillary action providing a pressure separation between the chip and the tool face. It increases tool life as much as 15 to 1, while maintaining close tolerances required by engineering specifications. Scrap pile wastes have been reduced as much as 40% where high surface finish and precision work is required. Man hours have been decreased as much as 85% due to the elimination of frequent tool sharpening or chang-ing. 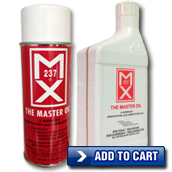 MX-237 is a versatile and unique oil, such that it qualifies as THE MASTER OIL. 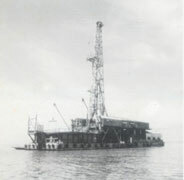 MX-237 is not a hydrocarbon and contains no petroleum distillates. There are no volatile or noxious fumes to encounter while working with THE MASTER OIL and laboratory tests have confirmed it a non-toxic. MX-237 is blended under a controlled patented process to insure it as a superior penetrating and lubricating oil. Quick Action Penetration - MX-237 is a fast and efficient penetrating oil. It dissolves rust, corrosion, and carbon upon contact when applied directly to the cause of failure. Following surface penetration and corrosion breakdown, MX-237 leaves a protective non-drying lubricant film to insure long-lasting protection against harmful rust and corrosion. Superior Lubricating Oil - MX-237's low-coefficient of friction insures less wear between moving parts. It's ultra high film strengh allows it to cling to the surface of moving parts to prevent metal to metal contact. MX-237 is an extreme pressure lubricant that will greatly extend the life of parts. A regular maintenance program with MX-237 will keep parts free from squeaks, corrosion and wear for a great savings in replacement aprts, downtime and lost man hours. 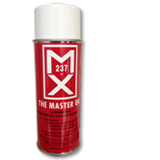 The unique properties and varied uses of MX-237 qualifies it as "THE MASTER OIL"
The ultimate wire rope lubricant and corrosion inhibitor! INTRODUCING A NEW ERA IN WIREROPE CORROSION PROTECTION Enter a new phase in the battle against water, corrosives, and acids with LIFELINE. This unique new rust inhibitor and lubri-cant will impregnate to the core quickly to provide long lasting protection from the corrosive enemies of wire rope and cable. 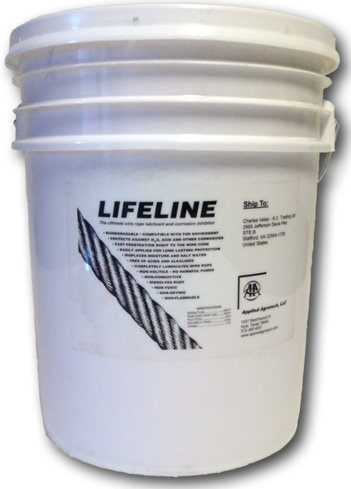 LIFELINE will displace moisture and prevent it and the corrosive chemicals from attacking the inner core as well as the surface of wire rope. Its ultra high adhesive strength will stay on working rope to allow internal movement necessary for long life. As wire rope stretches and flexes, LIFELINE is squeezed out to lubricate and protect the numerous wires and strands. PENETRATION AND PROTECTION TO THE CORE The two types of wire rope illustrated at right were taken from their same respective drums. The upper two pieces were dipped in a 15% solution of muriatic acid and the bottom two were dipped in brine water. All photos were taken one week after treatment. 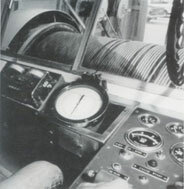 The wire rope has been spread open in order to demonstrate the complete penetration and protection to the core. 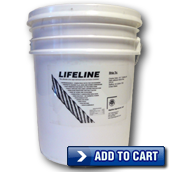 LIFELINE provides the same protection against other types of acids, saltwater, brine water, hydrogen sulfide, and other detrimental substances. APPLICATION LIFELINE can be sprayed on, painted on, or applied by immersion or automatic oiler. Low viscosity allows fast and complete penetration. Even if some spots are missed, the low surface tension of LIFELINE will cause it to creep and spread until the wire is completely saturated with the protective lubricant. It will actually repel moisture and is non-soluble in the various environments in which wire rope operates. A regular application schedule will keep wire rope flexible, safe and corrosion resistant. OILFIELD SERVICE AND DRILLING COMPANIES have saved thousands of dollars in repair and replacement costs with regular use of LIFELINE. It will protect wire rope against hydrogen sulfide embrittlement. It is ideal for use in perforating and swabbing operations. The life of wire rope in harsh conditions of acid, saltwater and hydrogen sulfide can be doubled with LIFELINE. It keeps the rope free of rust and corrosion for ease of movement. OFFSHORE DRILLING AND PRODUCTION operations can greatly benefit from routine applications of LIFELINE. It is highly resistant to attack from salt spray. It penetrates and lubricates wire rope, fittings, slings, swivels, pulleys, hinges, bolts, chains and clamps. This new corrosion inhibitor is ideal for all offshore operations from small bay rigs to North Sea giants, from crew boats to tankers or anything else requiring protection from the ravages of saltwater. And it is an environmentally compatible oil. COMMERCIAL FISHING requires a great deal of expensive wire rope that all too soon becomes unusable because of corrosion and stiffness which leads to kinks. LIFELINE will not only provide long lasting protection against corrosion, but its lubricity will help keep wire rope pliable for easier handling. LIFELINE is not thick and messy. It is a light, clear oil that is easy to apply and completely safe to handle. Penetration is so quick and easy that there is no fuss in coating a complete drum of wire rope in a matter of minutes. CLICK ON THE BUTTON FOR PRICING AND TO ORDER MX-237 & Lifeline!